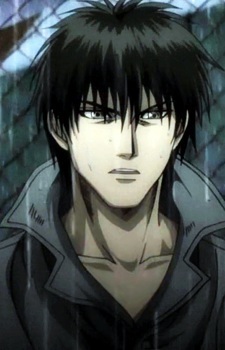 Sakuragi Rokurouta, aged eighteen, and referred as 'An-chan' by his cell mates. He is the oldest of the seven main characters. He is strong and has great boxing technique which he used to take on all the six newcomers when Mario instigated a fight at their first encounter. After defeating the six, Sakuragi is punished by the guard, and even while beaten brutally, he protected the six by taking all the blame. They learned the harsh reality of the world they were now in, and the six new cell mates realized that Sakuragi is in fact a kind person that is worthy to look upon and soon start to refer him as An-chan (can be translated as an 'intimate bro'). Sakuragi is the pillar and key figure through his words and actions for the rest throughout the series, especially Mario. The reason why Sakuragi has been detained is unknown at first. Rumors are he killed his own parents. After a grace period from escaping forceful detainment, Sakuragi is eventually stabbed by Ichihara near a US station. Half-conscious, he still attempted to reach and watch Mario during his boxing match, but he continues to walk towards the US station after being threatened by US troops to stop and drop his knife. Continuing to walk, they initiate fire and he is shot down and killed.